1. Lift the plastic tray and remove the non-skid pad. Place the non-skid pad in a circular formation on a flat surface (Illustration 01). Position the record on top of the non-skid pad to prevent scratching the vinyl. 2. Hold the Orbitrac body with rotating handle facing up. 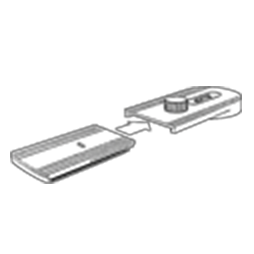 Insert flat side of cleaning cartridge and slide in the direction of the arrow until it clicks into place (Illustration 02). 3. Insert the long side of the pivot pin into the pivot hole located on the underside of the Orbitrac (Illustration 03). 4. Hold cleaning cartridge about four inches from spray bottle and lightly moisten white pad with two sprays of cleaning solution. complete three to four clockwise revolutions. 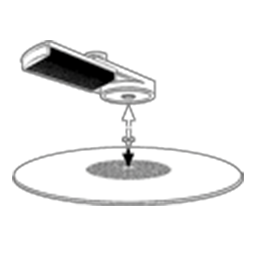 Remove Orbitrac from record with a smooth lifting motion. 6. After the cleaning process is complete, use the included brush to revive the white cloth pile of the cleaning cartridge. Use quick back-and-forth motions. If the non-skid pad is dirty after the cleaning process, clean with mild soap and water and allow to dry. Refills of the cleaning solution and replacement cleaning cartridges are available for purchase either on the Allsop website or by calling Allsop customer service at 1-800-426-4303.